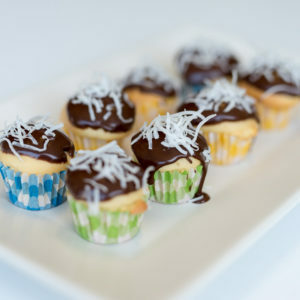 These little cupcakes are a delicious twist on the classic Lamington. A great recipe for little hands to help with in the kitchen and then enjoy their creations for afternoon tea! Using an electric mixer, beat the butter, the vanilla extract and sugar in a small bowl until it is light and fluffy. Add in the eggs – 1 at a time, beating the mixture after adding each egg. (The mixture will start to separate). Transfer the mixture to a large bowl and then stir in half of the sifted flour. Then stir in half of the milk. Repeat the steps with the remaining flour and milk until it is all combined. Use 2 level tablespoons of mixture for each paper case. Place them in the oven and bake for 15 to 17 minutes. Leave the cakes in the pans for 2 minutes. Then transfer to a wire rack to cool. To make the chocolate icing; combine icing sugar and cocoa in a bowl. Stir in the milk to form a spreadable icing, more milk can be added if necessary. Spread the icing over the cooled cupcake tops. Then sprinkle with coconut. Set cupcakes aside and leave them to sit at room temperature to set. Then share them with your family and friends!